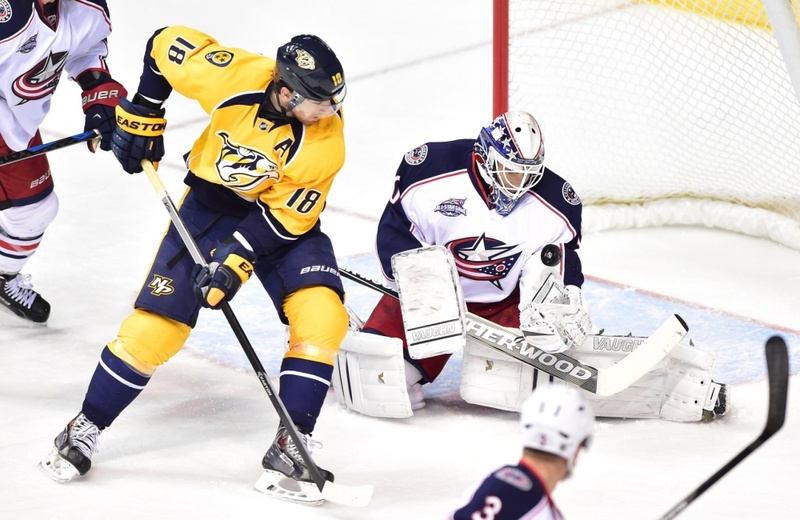 What Should The Blue Jackets Do With Curtis McElhinney? Could Curtis McElhinney’s Season End With New Contract? What a strange season this has been for the Columbus Blue Jackets. This team has had a 17 game stretch in which they lost 15. They’ve also had a month in which it was their winningest in franchise history. Talk about a team who has ridden a roller coaster all season. One player in particular, backup goaltender Curtis McElhinney, has epitomized this roller coaster ride the Blue Jackets have been on. He is currently 11-14-2 on the season, with a .913 save% and 2.78 GAA. But look at his season and how he got there. McElhinney went 0-5-1 in his 1st 6 decisions, while winning just once in his 1st 8 decisions. After that, he won his next 4 in a row. Then from 2/6-2/19, he won 5 of his 6 decisions, while Sergei Bobrovsky was recovering from a groin injury. McElhinney recorded victories in that stretch vs. the Blues, Penguins, and twice against the Flyers. But then from 2/21-3/7, he went 0-5-1. Last time out, Wednesday vs. Edmonton, he won in a shootout after making 44 saves. Fourth time this season #CBJ Curtis McElhinney has made 40 or more saves in a game. McElhinney has had a very interesting season to this point. He has gone 0-5-1 on 2 different occasions, while putting together 2 different winning streaks. Of note, he has also beaten the Boston Bruins twice. And remember the Rangers game in which the crowd at Madison Square Garden booed him every time he played the puck? This begs the question, is he more like the goalie who has gone 0-5-1 twice this season, or the one who went 10-4 from 11/19/14-2/19/15? The Blue Jackets are going to have to answer this question, as McElhinney is set to become an unrestricted free agent on July 1st. His contract this season came with a cap hit of $650,000. Given some of his recent performances, he would be due a raise, to over $1 million. Will the Blue Jackets resign him, or go with a different plan? If I was them, I would resign him. So far in his Blue Jackets career, Curtis McElhinney has played in 59 games. He is 21-25-3 all time with Columbus, with a .913 save% and 2.84 GAA. If you consider that McElhinney has played on a team, especially this season, where the Blue Jackets have been out-shot in a major way, his save% is pretty impressive. Wednesday was the 12th time this season in which Columbus has given up 40 shots in a game or more. I don’t fault him for the higher GAA, considering most of this season has been played without many of the Blue Jackets regulars. And if you recall last season, McElhinney was a huge reason the Jackets got to the playoffs. He played a majority of games while Bobrovsky was injured. That season was more representative of what he is, given there was a more complete roster in front of him. Now look at his potential next contract. He could be locked up for around $1-1.2 million. If you consider what some other backup goalies make, that can be a real bargain. For instance, Anton Khudobin has a cap hit of $2.25 million this season and next season. He is 8-13-4 with a 2.63 GAA and .904 save%. His career save% coming in was over .920. Michael Neuvirth has a cap hit of $2.5 million this season. He is 7-19-4 with a .915 save% and GAA of 2.98. Remember he played a lot in Buffalo this season. The point here being, McElhinney can be locked up for cheaper than Khudobin or Neuvirth, and can produce better numbers. If we have learned anything this season about the Blue Jackets, it’s that the goaltending depth in Springfield and other places is not that strong. Anton Forsberg has done well in Springfield, but when he was up in Columbus, it was a struggle. Oscar Dansk hasn’t been able to stay in Springfield. It’s been a struggle for him ever since the OHL playoffs last season for the Erie Otters. If Bobrovsky goes down, there needs to be a capable backup, especially given there is no NHL ready talent available. Resigning McElhinney would provide stability to that position until the goaltending depth is addressed. It would also be his 3rd season with the team, so he would be familiar with the structure and system the Blue Jackets play. The ultimate question here will be, are the Blue Jackets willing to pay McElhinney? Unless you want to see Forsberg or Dansk here next season, I would suggest they resign McElhinney. Could there be a free agent out there they’ll look at? Perhaps. Maybe a player will be available that could make sense. But all in all, McElhinney has been good this season. I think he deserves a new contract. We’ll see if the Blue Jackets feel the same way.